I love toast in the morning. It is simple and takes minutes to prepare. The problem was that it did not keep me full for long when I ate it on its own. So I experimented with various combinations adding proteins and fats to keep me from reaching for the mid morning snack. I settled on the combination of toast with black olive tapenade, avocado and poached egg. This combination is delicious and only takes 10 minutes to prepare. The great thing about this recipe is that it is very rich in monounsaturated fats (MUFAs) found in avocado, black olives and extra virgin olive oil. MUFAs are good fats. They can improve blood cholesterol levels and some research also points to MUFAs having sugar stabilising effects which can be helpful for those with Type 2 diabetes. 1) Fill the kettle with water and put it on. 3) Pour the hot water into a large pot and crack in the egg. I recommend to poach the egg for three and a half minutes – this ensures that the whites are set while the yolk is still runny. 4) While egg is poaching put the bread into the toaster. 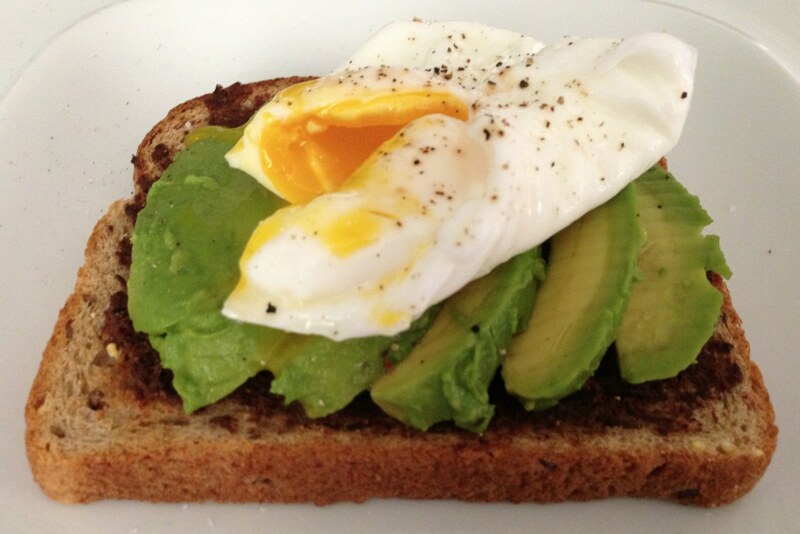 5) Assemble the dish by spreading the tapenade thinly on the toast, then put on the avocado and the poached egg. Finish off with a few sprinkles of black pepper and little bit of sea salt. 6) Tuck in and enjoy! Tags: Avocado, Black pepper, Cooking, Olive, Olive oil, Poached egg, Tapenade, Toast | Permalink. Exactly my kettle of fish! For those who could have it a tiny bit hotter take one red chilli pepper, cut it in half lengthways, remove all seeds and membranes, slice as thinly as you can and sprinkle a few slices on top. Delicious and chillies are supposed to be good for you too, I am led to believe. Nice – I will need to try it out next time. Here is a link to one tapenade recipe that I am using. It is nice and simple just use the salt to taste. The recipe uses too much salt for my liking.